U.S. District Court Judge Marsha Pechman today granted Washington Attorney General Bob Ferguson’s request to fast-track the multistate lawsuit filed last month against the Trump Administration’s family separation policy. In an unusually comprehensive 10 page order, Judge Pechman noted the unique background of this case and the particular risk of harm posed to the families involved. The Court discounted the government’s arguments that a San Diego Court’s injunction and order to reunite families would conflict with an order in this case, noting that Washington’s case raised several issues not addressed by the other case – most notably the government’s alleged refusal to accept asylum seekers at the border forcing them to enter illegally. 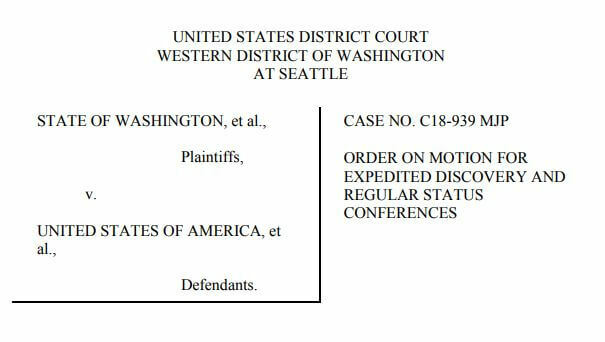 The Judge’s order also granted AG Ferguson’s request for regular status conferences, the first of which it schedule for Friday July 27, at 10:00 am in Seattle.